Since the last quarter’s issue of UPDATE, several events have occurred that have the potential for giving SSI a significant boost. The first, and most ephemeral, is an article in the October issue of OMNI magazine. The editors had requested it of me several months ago, as an idea for their Fifth Anniversary Issue. They called it a “Special Anniversary Collector’s Edition,” and gave the issue and my article the same title, “The Conquest of Space.” The rationale for SSI’s research program is the main theme of the article, and the Institute is listed with its address at the close. An excerpt from my original version appeared in your Third Quarter issue of UPDATE. And the benefits to SSI have already begun. The staff tells me that within the first few weeks the magazine was on the newsstands, several dozen new Members joined the Institute after seeing the article, and more readers have requested further information. Next, on October 1st, a permanent display that is directly relevent to SSI’s goals opened. At the EPCOT center of Walt Disney World, near Orlando, Florida, the HORIZONS pavilion, sponsored by General Electric, was formally opened. WED Enterprises, in Burbank, California, is the engineering and development arm of the Disney corporate family, and its officers had requested my input of ideas for HORIZONS as long ago as 1978. The SSI staff and I had taken care to give WED Enterprises accurate information, including blueprints, and the WED enterprises staff has followed them relatively closely. HORIZONS, which cost in total around $70 million, consists mainly of a ride, in special four-person suspended cars with unobstructed views, through a series of environments of the future. Included are an urban apartment, a desert home, an underwater station, and a space colony. Prior to going through the four environments, the ride passes through a hemispheric theater, in which a dazzling series of images is shown in wraparound vision. One of the sequences is a computer graphics flight toward, and finally through, an Island One colony, depicted through blueprint-like white lines on a blue background. The space colony part begins with a ride through space, in which several Island One colonies are in various stages of construction. 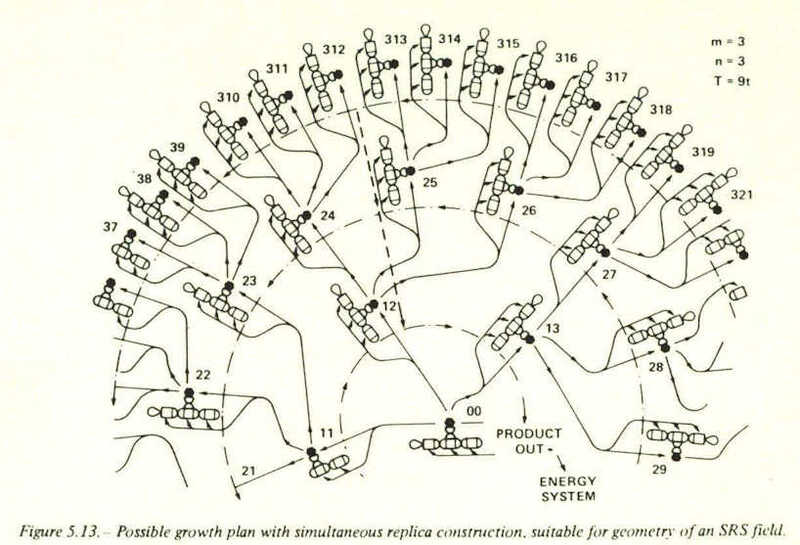 Then the viewer enters the docking port of another colony, sees the rotation of the land area “below,” and finally turns aside to see zero-gravity sports, a crystal­growing facility, and the other docking port. Finally, the four occupants of each car are given the opportunity to vote electronically on which of the four environments they want to visit for a brief, high speed thrill ride. All of the paintings used in HORIZONS, including that of the space colony interior, were done by Bob McCall, and a mural by Bob and his wife Louise is in the exit hall of HORIZONS. Some tips for you as SSI insiders: In the desert and underwater environments, the young man shown on TV and then in a welding scene is an audioanimatronic figure with the face of a WED Enterprises designer. The names of the children, on the shoulder-patches of the wetsuits in the underwater scene, are those of George McGinnis’ children. George worked closely with me in designing the space colony sequence, and was the principal creative designer of the entire HORIZONS pavilion. 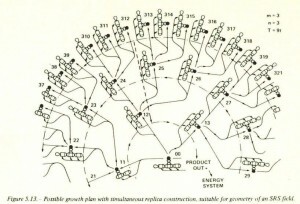 Note in the space scene that the rotating interior of one colony can be seen. As is inevitable in the struggle to create something artistic, when designers and people whose ideas were used had to interact with two large corporations, some things didn’t come out as we could have wished. The mirrors were left off the colonies, but that was probably necessary in order that the viewers not be confused by detail. The colony interior is far more urban and monolithic, much less intimate, small scale and people-oriented, than I wished. Some masking of the interior was also required for film-technical reasons. (Only the real Island One colonies in space can be as visually open as we wish.) 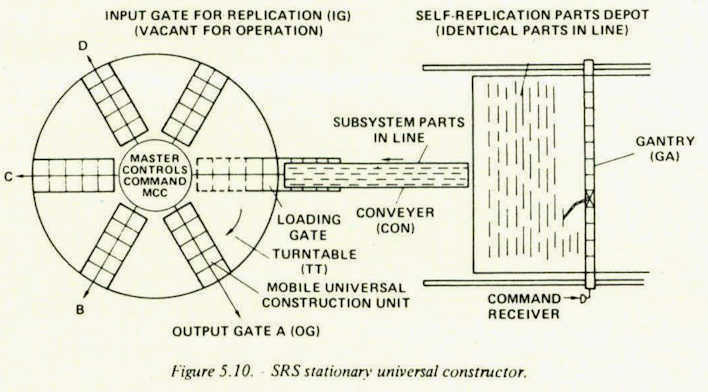 And everything connected with solar power satellites, which I had wanted as a main feature of the open-space sequence, was left out because GE feared that satellite power was “controversial” following the N.R.C. 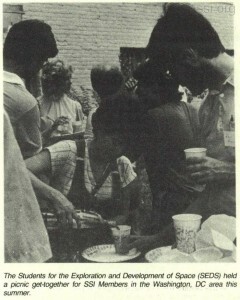 review in 1981 . And as the logical purpose for Mass-Drivers relates to large scale construction in space, there’s also no view of Mass-Driver operation. But what is there is as accurate as one could reasonably hope for, and everyone seems to think that HORIZONS will be a popular exhibit. 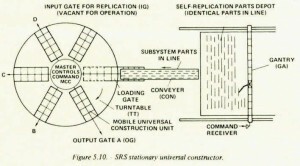 Still under discussion is some mention of SSI in connection with HORIZONS. Whatever we come out with, in our meetings with WED Enterprises, we will be using HORIZONS extensively in our direct mail and advertising. 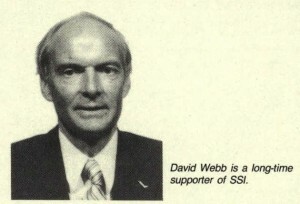 “Our” part of it is worth at least $20 million, and it didn’t cost SSI a cent. Executive Vice-President Gregg Maryniak and I, in consultation with the SSI staff, are planning a gala event for SSI supporters in connection with HORIZONS. It will be a trip to Florida combining the observation of a Shuttle launch (probably the one at the end of January 1984), with a visit to HORIZONS, seminars and a Senior Associate reception. The cost will be approximately $300.00 per person. See the special notice about this event in this issue of UPDATE. Finally, because of the successful operation of Mass­Driver III and the near completion of the Rockwell International research on the separation of lunar soil into pure elements, we have decided to advance the schedule of SSI’s research. At the beginning of November, a group of us from SSI, from aerospace and from consulting firms will spend two days writing SSI’s Request for Proposals (RFP), for the design of a Solar Power Satellite optimized for lunar materials. The generous response you have given to the special appeal SSI made for SPS research has made this advance in schedule possible. The officers, staff and Trustees of SSI join me in thanking you for your support, and we have every reason to hope that the Institute, thanks to your efforts, is ready to accelerate a healthy growth and research rate. This is the final quarterly issue of UPDATE for 1983. Beginning in January 1984, UPDATE will be published in six issues per year, in order to bring you research results and news more often. With all the support and recruiting being done by Members and Associates, the staff in Princeton has been working hard to keep up with the new supporters and requests for information that have been flowing in. It’s a good feeling to add Members’ names to the computer base (which is starting to strain the capacity of our current hardware) and to welcome the 125 new Senior Associates that have promised their extra support since the last newsletter. Many thanks go to all of you who’ve given your time, as well as your money. Senior Associate Dennis Mateik has organized groups of volunteers from the Washington and Baltimore areas to stuff this newsletter, and to help with mailing lists on SSI’s computer. Member David Gump is working with a weekly publication, Space Business News, and has offered to send each of SSI’s supporters a copy and subscription information. Karl Rove & Associates, the Austin, Texas mailing house that has helped the Institute grow by leaps and bounds this year, will be handling the distribution. In this way, SSI can keep your addresses confidential. Thanks go to Jamie Clements, SSI’s customer representative, for all of his hard work with our mailing ventures. And thank you to Steve Aimes for his help, with apologies for missing his name in the last issue. the results given at the May Space Manufacturing Conference. The speech was well received, and the student group was most interested in other phases of Institute research. RCA Astra-Electronics presented SSI with a $1,000 grant earlier this year, as we mentioned in the First Quarter issue of UPDATE. 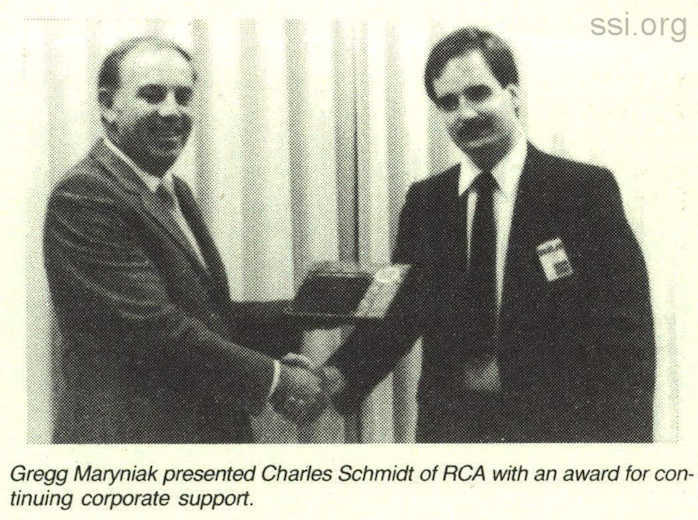 During his October visit to Princeton, Executive Vice-President Gregg Maryniak presented an award to RCA’s General Manager, Charles Schmidt, for continuing corporate support. 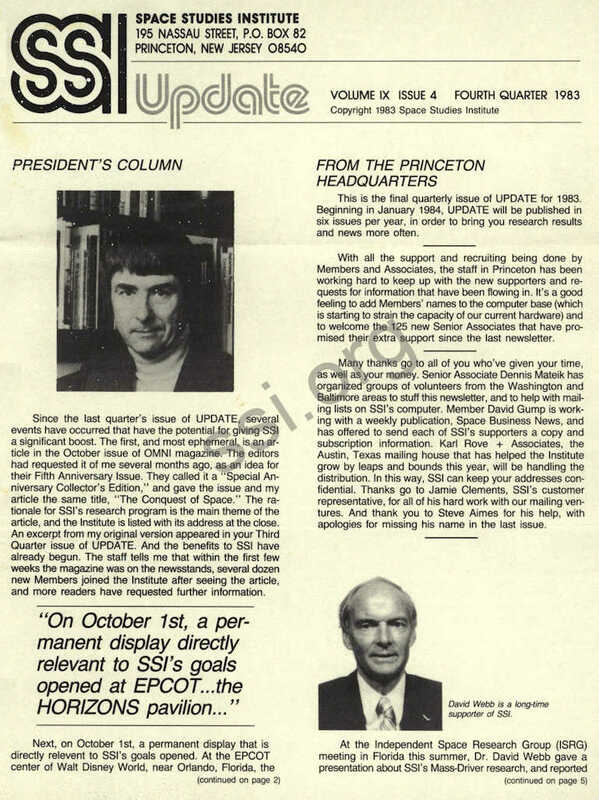 The Proceedings from the 1983 Conference on Space Manufacturing were mailed by the publisl1er, Univelt, during the third week in October, after a few delays in printing and binding. Conference attendees should already have received their copies before reading this. If not, contact Univelt at the address below. Several articles by Dr. O’Neill, or about the Institute, have appeared in major magazines in the last few months. OMNI’s article is mentioned in this issue’s President’s column. SOFTALK magazine, published tor Apple computer owners, carried an interview beginning on page 230 of the September issue. And November’s TECHNOLOGY ILLUSTRATED has another interview of Dr. O’Neill by reporter Dennis Meacham. 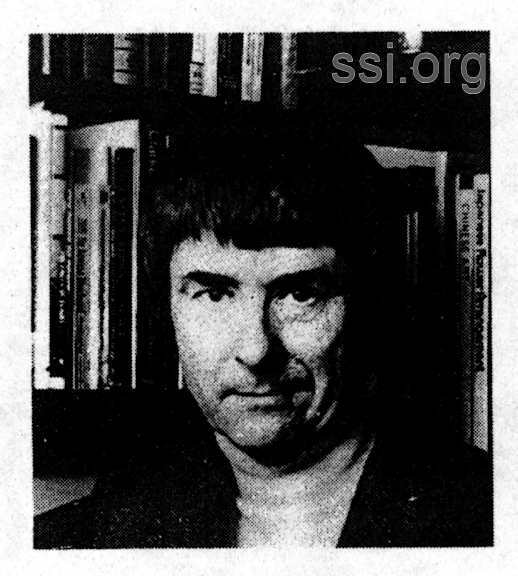 Bernard Goldhirsh, TI’s publisher, graciously donated a full page advertisement for SSI in that same issue. With all the help and support from all of you, this has been the most productive year in the Institute’s history. Be sure to look over our year-end report on page 4 of this issue. And warm thanks to each of you whose efforts have made 1983 a banner year for SSI. Many of you will be interested in touring the new General Electric HORIZONS exhibit at Florida’s EPCOT center. The display includes a journey through an Island One space habitat, described by Dr. O’Neill in this issue’s President’s Column. We’ve also had many letters expressing an interest in viewing a Space Shuttle launch. Accordingly, SSI is examining the possibility of a two to three day combination EPCOT tour and Shuttle launch package. We are looking at a way to bring interested Members and Associates inside the launch complex for the tour. We presently estimate the cost for the tours, lodging, several seminars on SSI’s programs, a reception and banquet at approximately $300.00 per person. Please note that this DOES NOT include airfare. A good choice for a Shuttle launch is the one scheduled for January 29. As our next newsletter will be reaching you at just about that time, interested supporters should send a self-addressed, stamped business size envelope to the Princeton office for further information. This issue’s guest is Mr. David Hannah, Chairman of the Board of Space Services, Inc., launcher of the Conastoga rocket, and the first privately-funded space program in the United States. SSI staff member Erin Medlicott met with him in October for this interview. 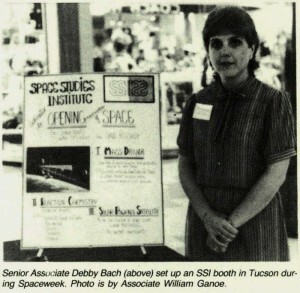 SSI: How did you first become interested in a private space venture? SSI: Can private enterprise fund a competitive space program? DH: Yes. I think the main reason that we can fund it is that we can take state-of-the-art-space technology, and utilize it much more quickly than a government or an agency, or even a large corporation can. We can make changes in design better than any one of those three; that’s what private enterprise can do best. SSI: What will the initial costs be? DH: In our particular program, we have two phases. The total cost for our first launch vehicle is going to be about 20 million. Subsequent launches will be less than 10 million. The next phase involves the spacecraft and Earth-sensing equipment. Each one is so individually designed, and the state-of-the-art is changing so rapidly, that we’re talking about 20-30 million each time. SSI: What is your biggest obstacle right now, as a private space enterprise? DH: Financing. Although I believe our program is a commercial entity, the investment community has not shared that particular insight. Some of the older systems are getting help from Shearson/American Express, and there are some indications that the economic community is beginning to see a possibility for some developments. Of course, communication satellites are well accepted as a financial vehicle. But the low-Earth-sensing market, which is what we’re in, hasn’t yet been proven a good commercial market. I think the reason is that the market’s going to expand and grow after we’re up there. SSI: So investors are looking for a quick payback and they can’t be guaranteed of that? DH: That’s right. It’s the same problem Federal Express found. They couldn’t very well say they had overnight delivery until the whole system was in place and they were able to “deliver overnight.” But one of the differences between Federal Express and us is that I don’t believe in competition with the government. I think we’re being supported and given encouragement by the government. DH: The different departments we’ve talked to. We told them about our launch vehicle and about Earth-sensing ability, and the cost of reproducing that ability. It fits in very definitely with their needs: there’s no other inexpensive launch vehicle that’s being manufactured today, and we can nearly duplicate Landsat’s abilities, for example, for about one­fourth the cost. SSI: Does the government view you as a competitor? DH: I think they view our plan as something that needs to be brought along, and they’d like to see us succeed. 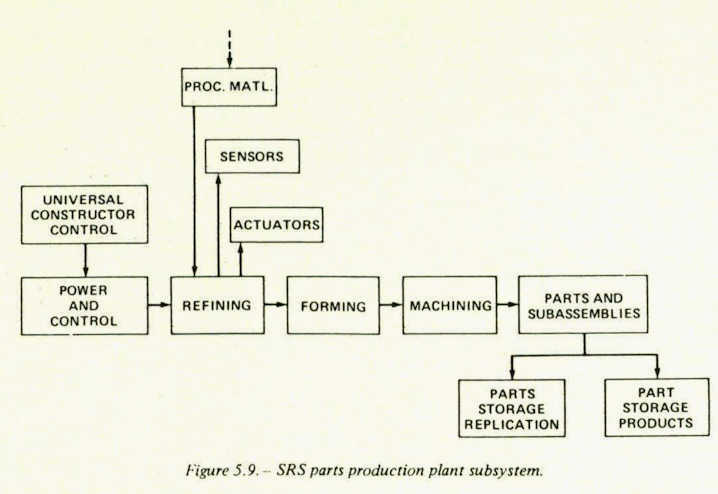 SSI: How will launch vehicles help to open space for manufacturing facilities? DH: The government is the major user of Earth-sensing equipment and data using government launch vehicles. More private groups would use that information if it were available. Until we can take our Earth-sensing equipment up there, where groups can begin to build a system they can depend on, I don’t see the market going anyplace. Right now, Landsat is up there and in trouble; perhaps even brought to a stop. Well, who would put a million dollars into a system when it may be teminated? The French and Japanese are coming along with something of their own. And ours is going to be up there one way or another, eventually. When it’s in place we can think about using it on a regular basis, altliough there aren’t a lot of people who see that potential just yet. Once it’s there, groups will begin to say, “Well, now that information will be available to me all the time,” and they’ll begin to plan. SSI: Do you feel there should be more or fewer governmental regulations for private space ventures? DH: I think there are enough; we don’t want any more. SSI: What is your position with Space Services, Inc.? DH: I’m Chairman of the Board. 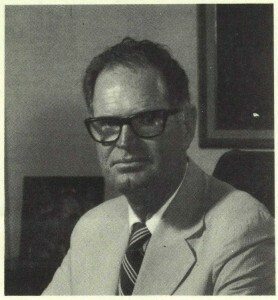 Donald K. (“Deke” ) Slayton is President. SSI: How long has he been working for you? DH: He came on board at the beginning of last year. It will be two years in January. SSI: It’s great that you’ve got a former astronaut working with you. DH: He’s the best, and has been great to work with. It’s really been an inspiration to us to work with him. SSI: What about the other members of your Board of Directors? DH: We have Walter Murphy of HCM, a contractor here in Houston, who got Toddie Lee Wynn, Jr. Mr. Wynn is the son of Toddie Lee Wynn, Sr. who died the day of our launch. Loyd Hackler is a representative of the National Retail Federation in Washington. Rich Rasmussen, President of Space Vector did our launch control design, the guidance systems. John Duncan is chairman of the Executive Committee at Gulf and Western. There’s also David Hannah III, besides “Deke” Slayton and myself. SSI: In four years, Space Services, Inc. has grown from a dream to a success story. What do you hope to accomplish in this decade? DH: What I’d like to see happen is government’s acceptance of our ability to continue to produce Landsat data. Right now that data has to be done through the government’s auspices because they’re still in the picture. As the private sector market grows, we would like to be allowed to commercialize segments of it, to better utilize the Earth­sensing rocket, and to use our launch vehicle to do it. SSI: Do you see increased interest in the space movement since the success of your launch? DH: Sure. Lots of small companies have called us and said they have plans on the drawing board, and there are more that see the opportunities and are beginning to explore them. I don’t think many of them are getting very far along, because it’s not a quick thing. It takes time. But I see more of those small companies emerging. SSI: Do they see you as the “successful boy on the block” ? DH: I think they feel if I can do it, they can too. SSI: Do you see yourself someday living in space? DH: Not me, but I’m sure my grandchildren will. SSI: What career advice can you give to young people? DH: Space is such a broad area, and it has so many ramifications. 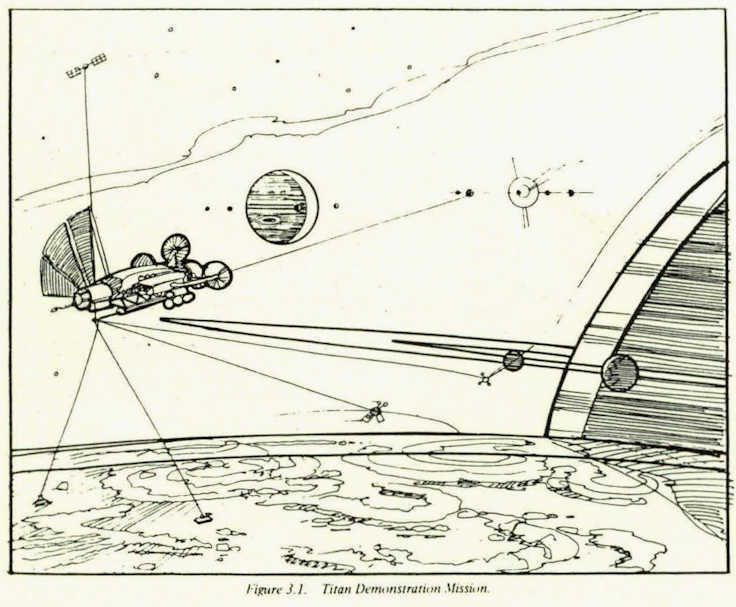 If I were starting out, I think I would look at the whole spectrum of what’s going to happen in space, pick out an area that particularly appealed to me and concentrate on it. I’d make myself an “expert,” so that when that facet of development took place, I’d be ready to respond to it. 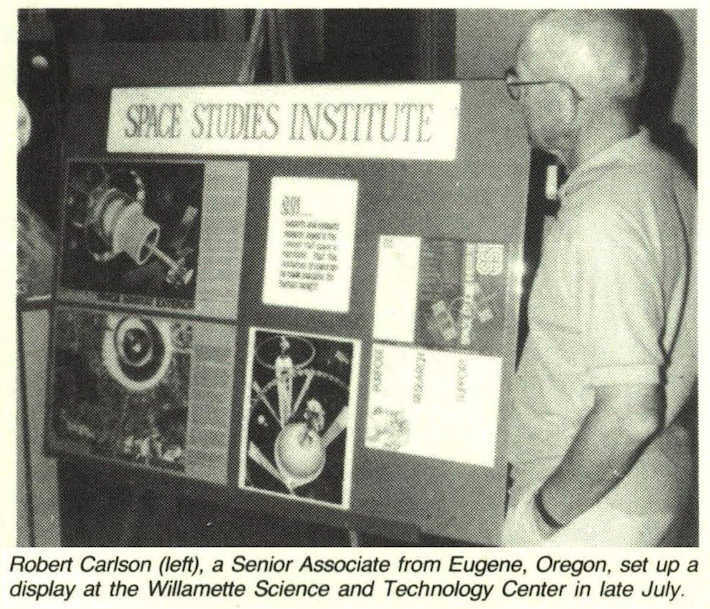 1983 has been a busy and exciting year for the Space Studies Institute. An increased number of supporters, with a corresponding increase in funds for research, has been the driving force behind this year’s success. Following is a list of some of 1983’s achievments. • A growth of the Membership base with about 1,000 new Sustaining Members and 250 new Senior Associates. Careful prospecting in the direct mail field is primarily responsible for this increase. • Increased exposure in the media. The generosity of several publishers has allowed full-page advertisements to appear in three major magazines this year. Dr. Les Snively appeared on ABC-TV’s LAST WORD program during one of the Shuttle launches. Senior Associates and Members alike have borrowed SSI’s traveling exhibit for use at exhibits and conventions. Dr. O’Neill has continued his lectures around the country. A local television team covered the Mass-Driver tests this spring. • The immensely successful Sixth Conference on Space Manufacturing, held in May. More than 100 participants from around the world exchanged ideas and papers. 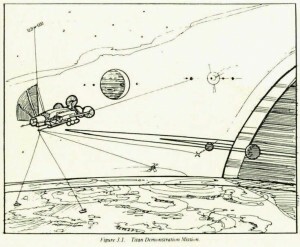 Space stations were the main topic of consideration. Designs, ideologies and the history of such platforms were discussed. Proceedings of the Conference have been released in the American Astronautical Society’s series, Advances in the Astronautical Sciences. • Construction and testing of Mass-Driver III. Demonstrated during the May Conference, MDIII achieved accelerations of 11,000 m/sec2 during tests. Currently, the computer simulation and calculation portion of the project is being revised. Several of you have sent letters with offers of help in the computer field. Dr. Snively will be making selections from among them in the next month or so. • Completion of the chemical-processing research project. Dr. Robert Waldron, head of the Rockwell/CalSpace work, has indicated that the final steps will be completed at the end of November. He is writing a summary for the next UPDATE in January. • The first demographics survey of Members and Associates was finished this spring. The Princeton Headquarters staff is planning to continue the study as more new Members add their support. Each new Member is sent a questionnaire, and the response has been excellent. We hope to conduct surveys of all Members in Conference years, and track the Institute’s growth. During the next few months, several Teams will be undertaking a variety of projects, including making calls to former Members of the Institute. Please don’t hesitate to offer your help to the Team nearest you. Your support is helping to open the High FrontierSM. The concept of robotic systems in space, toiling night and day to create useful products from Moon soil and the perpetual sunlight of space, is one of the most exciting scenarios for space industrialization. 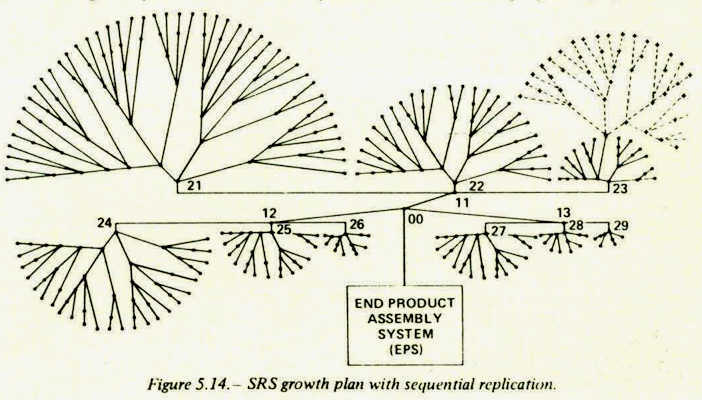 The further possibility of these systems building copies of themselves in addition to end products (self-replication), starting from a relatively tiny “seed” landed on the Moon (bootstrapping) could completely revise the economics of space exploration. 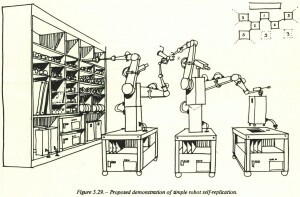 Up until now there was no single convenient reference work on the subject of these fascinating systems. 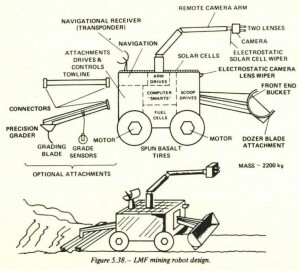 NASA Conference publication CP 2255, entitled Advanced Automation for Space Missions provides much of this information. 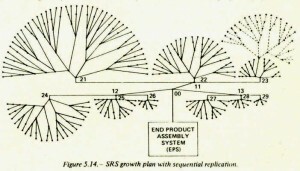 The book is actually a copy of the proceedings of the 1980 NASA/American Society for Engineering Education Summer Study held at the University of Santa Clara in 1980. 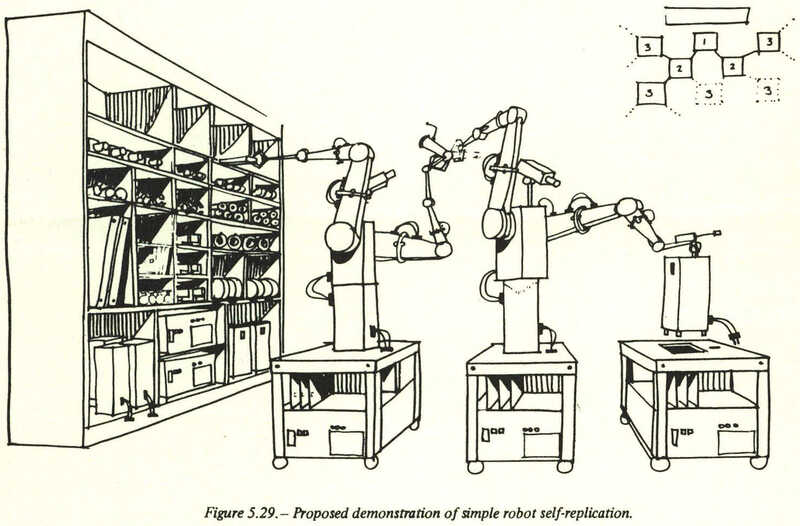 The drawings accompanying this review are illustrations from the study. 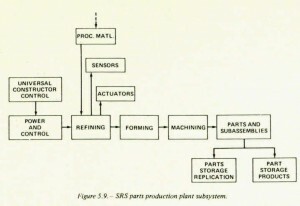 As you can see, it contains a wealth of information on space manufacturing. In addition to space industrialization, concepts for advanced space probes are presented. Highlights of the book include an excellent summary of the work of John Von Neumann, whose work provides the theoretical basis for self-reproducing systems and extensive bibliographical references which will enable the reader to pursue further research in this area. [ ] This is a renewal. [ ] New address. [ ] I’ve done my part. Here are checks or money orders from ____ new SSI Members, all of whom have joined with at least a $15.00 donation. [ ] Here’s my special gift of $_____ for the Solar Power Satellite design study. [ ] I’d like a list of SSI’s items for sale. Here’s my self-addressed stamped envelope.